Fresh to the Koh Chang property market, this brand new resort is now available for immediate sale. 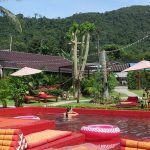 Located in one of Koh Chang’s most popular quiet areas, the new resort consists of 5 individual bungalows, reception area, massage room, staff room and kitchen. Set back a few metres from the road, the resort is fronted by an individual ticket booth and car parking area. From here, a few steps take you into the raised reception area with wooden floor and surrond built-in seating. The massage room, staff room with its own ensuite bathroom and the kitchen sit off a corridor behind this entrance. At the rear of the building, you’ll find another toilet and laundry area with storeroom. Behind this entrance area and arranged off a simple path with lawned garden, 4 bungalows are positioned side by side going up the slope with the 5th off to one side on its own. Each a/c bungalow, complete with its own balcony, is ensuite with a hot water shower and fitted with king size heavy wood beds, fridge and cabinets. At the rear of this brand new resort is space for 2 more bungalows or possibly a plunge pool with decking. All utilities (electricity, internet) are fully connected, with the water supply coming from the metred local source. Food, alcohol and hotel licences are all fully up to date. At an annual rate in line with other similarly sized land rentals in the area, the current contract is 10 years and fixed but the local landlord is very open to negotiation on a new long lease going forward. This brand new resort for sale is ideal a first-time owner, with everything already in place and up and running – a perfect turnkey opportunity.